is elated to Celebrate the Life of this extreme kind heart, creative spirit and women’s activist. Author, publisher, women’s supporter and all round awesome woman that walks with a soft step, yet carries a big message. Susan Winlaw was born and raised in Southern Ontario, Canada. She went to College Avenue Secondary School and then attended the University of Guelph where she received a BASc in Home Economics/Textiles. After graduation Susan started a long career at Sears Canada Inc. covering a variety of management roles – Textiles Lab Technician, Retail Department Manager, National Management/Buying positions and IT Project Manager. Susan is married to Alex Law and joined him as an automotive journalist in 1993. Susan has provided articles to newspapers and on line publications regarding safety in and around the car. In fall of 2008, they published Car Advice For Women (and Smart Men) to help people with the single biggest purchase in their lives outside of a house and its renovation. All of this meant a lot of away from home with many movies to watch in the air and in hotels. This added to the love of watching and commenting on movies with Alex at home. Susan provides a completely different perspective than Alex in the types of movies enjoyed. Together they cover a broad spectrum of interests. Susan is a member of WEN (Writers and Editors Network), eWomenNetwork, WINGS and other professional and social groups. Susan speaks to women’s groups, libraries and schools about safety and security around cars as well as the writing/editing/ publishing experience. And although this is all wonderful, she’d rather be crocheting, sewing and of course watching and talking about movies with friends and family. “I am so excited that we are just about to launch our third book and I’m just starting my blogging journey. 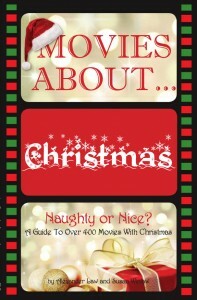 After a lifetime of viewing movies and a solid 24 months of gathering, looking at the films again and creating reviews, we’re now sending Movies About Christmas to the printer. This is the second book in our movie review by category series and we’re pleased with the results. So send me a note, connect with me on facebook, or LinkedIn or twitter and let me know your fav films. We cannot promise to get them into the books, but we’ll certainly watch out for them and discuss them on our various pages. 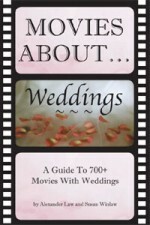 It took us about 18 months to get the first one ready and we only had one piece of weirdness happen with Movies About Weddings. Somewhere between the 5th and 8th edit, 3 reviews vanished from the copy. One of them was Four Weddings and a Funeral – but then anyone who’s been watching movies for at least 10 years will know all about it, so it’s not a major concern. Watch for the review of it and the other 2 on our web site. It will be in the next edition of the book. The we involved is myself and my husband Alexander Law and we’re having fun creating our Movies About … books where we provide an overview of many movies on a specific subject matter. Look for the announcements here on when the next books will be coming out. 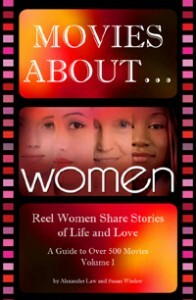 (spring of 2011 should see Movies About Women Volume 1) . I’m learning all about blogging now and I appreciate any words of advice on how to get it right here. I’ll open up comments on the blog page, but I won’t be posting any irrelevant comments, so make them count. To some extent, behavior modification — do less of that, do more of the other — can have a mitigating affect on the various things that kill or harm women every day. Taking steps that help you live longer and avoid various injuries is nowhere more useful than it is with the fifth leading cause of death for all women in America — accidents, which primarily means car crashes, falls and fires. For these mortal threats, the changes necessary to reduce your risk mostly involve buying modification, which is much easier to do. As this book hopes to make clear, if you make smart choices in several areas — car selection, kitchen and bathroom design, and stair awareness — you can greatly reduce your risks on the deadly accident front. -The Insurance Institute for Highway Safety lists the cars that women should avoid if safety is a top priority, and dozens of popular models are on it, including Chevrolet Cruze, Fiat 500, Ford Focus, Honda Civic, Mazda 3, Mini Cooper, Toyota Corolla, VW Golf and many more. -How setting up a Women’s Safety Circle at work or in your neighborhood could help reduce risks that you can’t overcome on your own. -For the sake of home decor concerns, women forego useful (but unattractive) bathroom safety features. -Women are largely unaware of how much scarring (mostly on the face) results from various injuries, particularly from the car crashes that are the primary cause of death for women under 35. -Open-concept rooms that include kitchens increase dangers from fires, stabbings, scalding and falls. -Why pregnant women should seriously reconsider the time they spend in cars and the way they drive. -Living alone can present special safety challenges that can be mostly overcome with some thought and some spending. -The value of having a place to go during a home invasion or other personal attack. -Don’t leave anything loose in your car that you wouldn’t want to have hit you in the face one day. -How to spot a potential abuser before you start a relationship and it’s too late. -How drinking coffee can leave you scarred for life, on the face, chest and in your lap. -Perhaps it isn’t necessary to use a deadly weapon (an 8-inch butcher knife) to cut up the carrots and celery for the healthy soup you’re making. -Keeping teenage girls out of cars driven by teenage boys by using parent pools, taxi and limo services would reduce their death rate. -Adults backing up cars can easily avoid running over children or pets without the use of a rear-view camera, if they make a little extra effort. -If you’re planning on a romantic evening, you should probably consider the need to practice safe candles. -How thinking about a disastrous situation can help you stop it from actually happening. -A specific suggestion for how you could avoid ever stopping for gas again, and why it’s important that your gas tank should be as full as you can keep it. -Carry personal medical information to aid emergency workers. -Red and processed meats present a special kind of danger. -Techniques for avoiding the deadliest type of car crash that can happen to you. -A personal emergency kit should be built for life as you really drive it. -Why you might want to get your tub converted into a shower stall. -A flat tire doesn’t mean your can’t drive your car if you think you’re in danger where you are. -Ways that you might be attracting people looking for someone to rob. -Bringing an infant into bed to sleep with you can be a very bad idea. -Unique dangers for people who ride in those 15-seat vans. -Putting kids, pets or anything you hold precious in the third row of a compact CUV is an extremely bad decision. -How bumper stickers can put your security at risk. -Opening your door (even with a chain) can be the biggest mistake you’ll ever make. SWAN DAY – Celebrated MARCH 30 around the globe. welcomes this leader among women with open arms into our Alumni of WOMEN of ACTION™. Oh thank you so much for this incredible post. A few of the links are older ones that I no longer have, but I will work to see if I can fix them asap. We still have a few copies of Car Advice For Women (and Smart Men) left and the best way to get them is through a direct message to me at susan@bampress.com. I wish you all a fantastic life and I look forward to chatting with any of you who see this article.